A new design for a Doha paper. 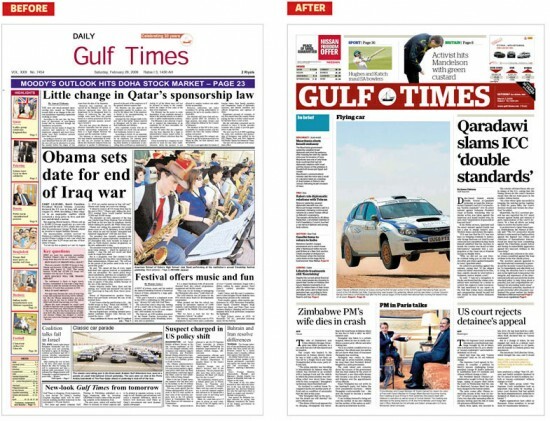 Above: Via the Shakeup Media Blog, one example of the new design for the Qatari newspaper by Shakeup Media partners Richard Addis and Ryan Bowman. See the full set of images and story by Ellen Carpenter. Mabrouk! New York Times / Recycling programs threatened? This entry was posted by Erik Brandt on Monday, March 23rd, 2009 at 9:55 AM	and is filed under Aktuell, Education, Geotypografika, Globalization, Graphic Design, International, Internet, News Links, Newspaper Front Pages, Typografika, Typography.